How to increase glutathione levels to protect against oxidative stress is essential to healthy aging. Glutathione benefits from diet and glutathione supplements will help prevent cell damage and protect against cardiovascular disease and cancer. Glutathione is a non-essential amino acid composed from l-cysteiene, l-glutamic acid, and glycine. It can be synthesized in all cells of the body, but must be synthesized in the liver. GSSG is recycled back into GSH by gluathione reductase. When the ration of glutathione disulfide increases as a percentage of total glutathione, that is an indication that oxidative stress is elevated in the body. Why Are Glutathione Levels Important? You need to know how to increase glutathione levels because this amino acid is THE most important antioxidant in your body. It is your most important line of defense in protection against the cellular damage that can lead to life threatening medical conditions. You can raise the levels of this vital antioxidant through diet, and the use of glutathione supplements. Cooking and pasteurization destroy the glutathione content of foods, and storage affect the amount of glutathione left in foods as well, hence the need to eat your foods in the freshest and least cooked state possible. 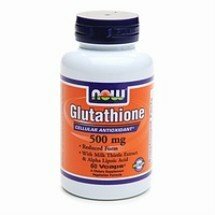 Glutathione supplements are not very effective when taken orally due to the fact that they are deactivated by your digestive system. However nano-liposomal gutathione is claimed to be 90% bioavailability rate when taken orally. This form is said to rival inter-venous glutathione for effectiveness and glutathione benefits. Knowing how to increase glutathione levels will enable you to protect your body against the the toxic effects of free radicals and reactive oxygen compounds, by protecting your DNA, and boosting your immune system.